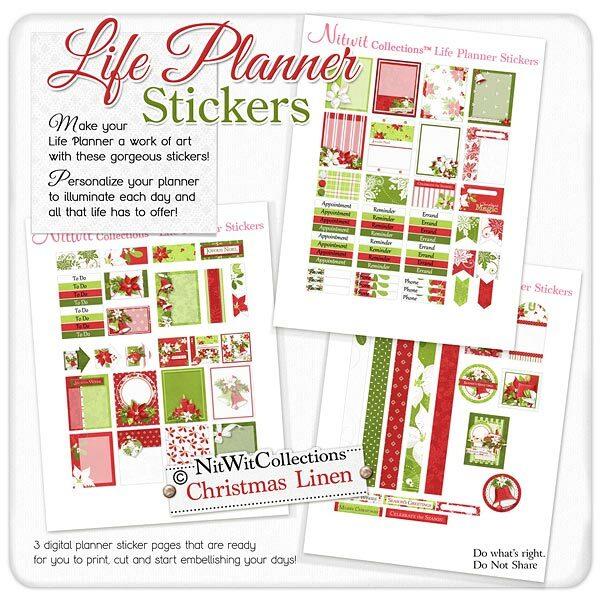 "Christmas Linen" Life Planner Stickers showcases the traditional Christmas images to decorate your planner pages with. Poinsettias, a candle centrepiece, Christmas bells and so much more all created in the quintessential red, green and white Christmas colours. Decorate your life planner pages every bit as much as you decorate your Christmas tree and enjoy the spirit of the Season! 17- 1.5" x 1.9" full boxes - created with a great Christmas feel and plenty of writeable areas for you....there's lots to remember!! 8 - Appointment digital stickers in four colours of this sticker kit...which one do you love best?! 2 - Arrow elements in a damask green and red....what could be more Christmas? 3 - Arrow elements that you can use to illuminate those important notes for this month....parties, get togethers with friends, and of course when Santa is arriving! 1 - Bookmark strip for Christmas....now which day will you really want to remember?! 1 - Christmas sentiment - "Season's Greetings"
1 - 1.5" x 1.9" full box card....doesn't it look like a Christmas card front?? Where's the perfect spot for you to place this in? 4 - Sentiment tags that let you easily add in Christmas cheer to your planner pages.